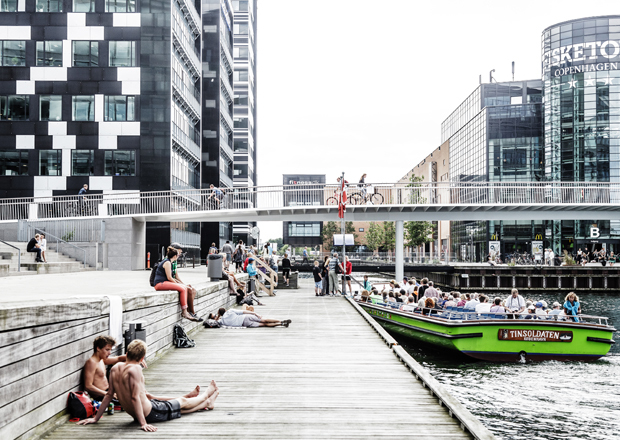 With the change from commercial harbour activities to residences and retail the Inner Harbour of Copenhagen has undergone a pronounced transformation. 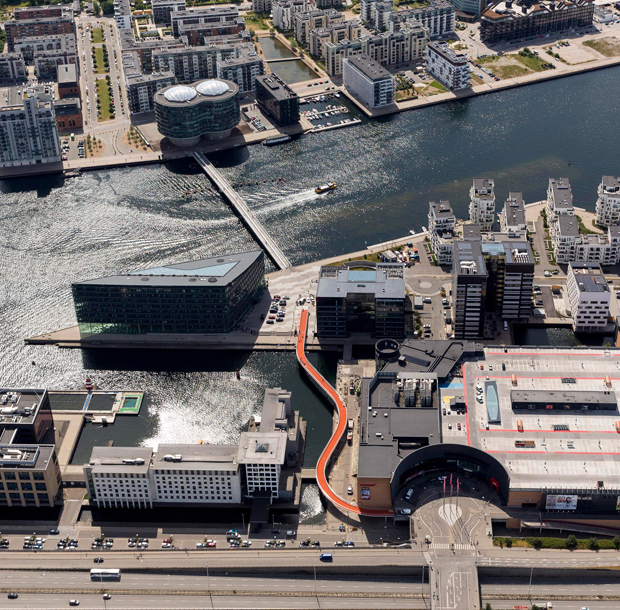 As part of this transformation the first stage of a foot- and bicycle connection across the Inner Harbour the Brygge Bridge, Bryggebroen by DISSSING+WEITLING architecture, was opened in 2006 . The first new crossing of the harbour in fifty years. 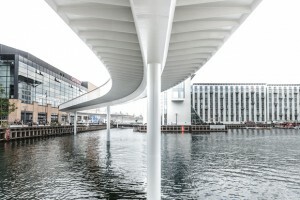 The bridge became a tremendous success not only as a connection between two parts of the city, but also simply as a way to enjoy the views of the harbour, the sensation of being above water. However heading to or from Bryggebroen on the Eastern side of the Harbour cyclist had to carry their bikes down or up a full flight of stairs at one end of the quayside. 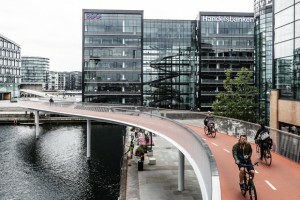 Cykelslangen, or the ai?? ?The Bicycle Snakeai?? ?, a 230 m long sky bridge which offers a short cut to Bryggebroen was opened in the summer of 2014. 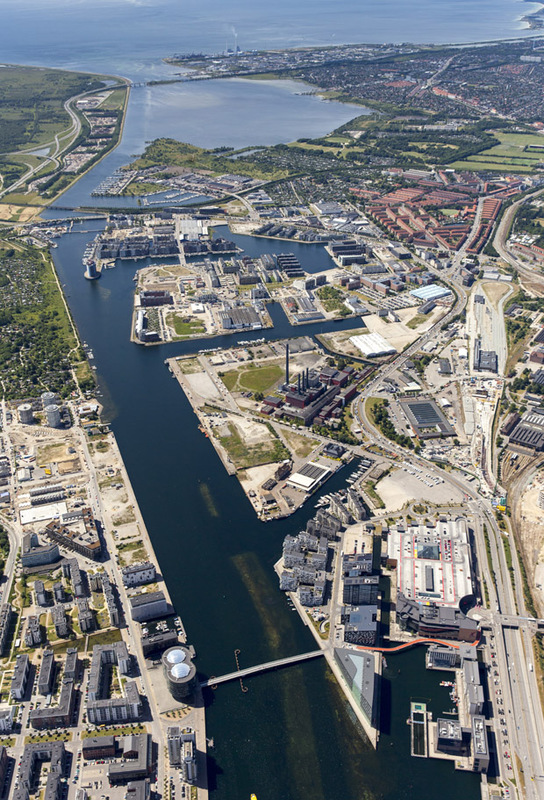 Cykelslangen takes off where Bryggebroen ends on the Eastern side of the harbour and continues in a meandering course to Kalvebod Brygge, a major roadway, some 5,5 m above the quay. 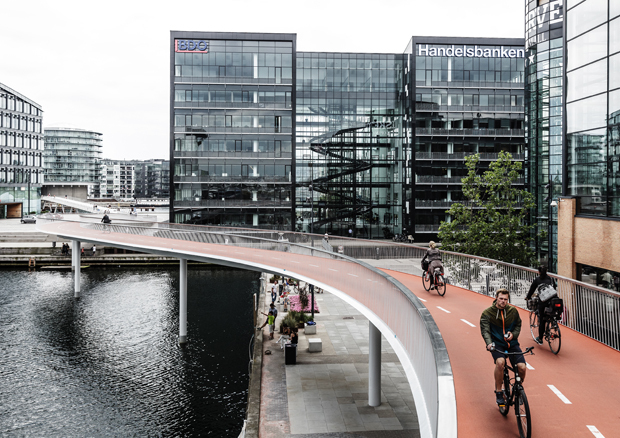 Cykelslangen is used by 12.500 cyclists daily. A clear pathway. 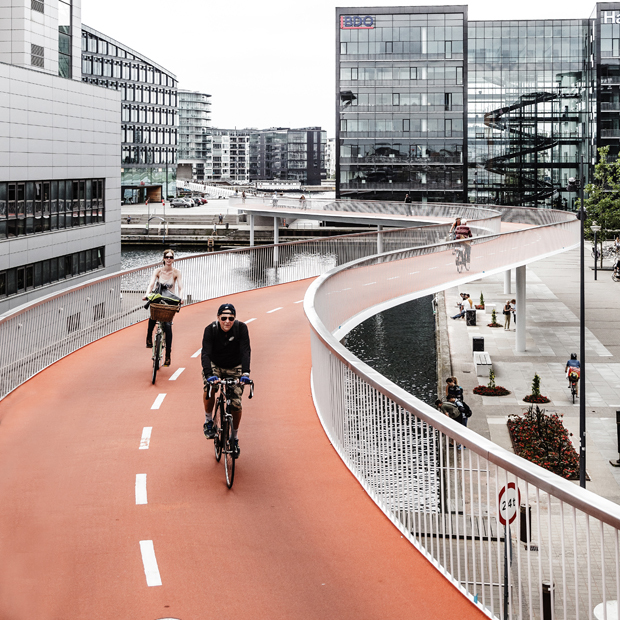 Hereby not only making it more joyful to ride on, with less steep gradients and better curvature, but also making it an element that could pull together an area with a multitude of incoherent buildings. 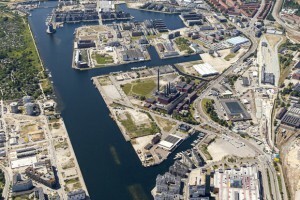 We proposed a series of alternatives and discussed them with the client, the City of Copenhagen. And the city listened and contributed to the idea. The city s project manager brought it up higher in the administration. The budget had to be raised and a dialogue with neighbours to be commenced. 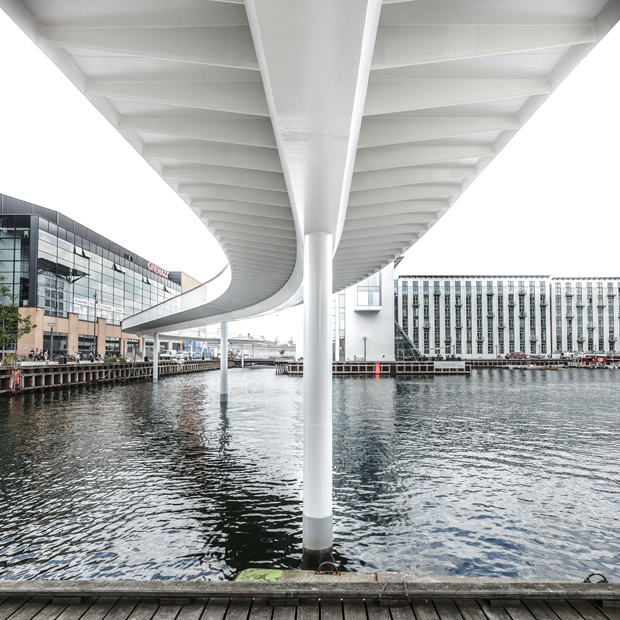 Not only did it go through, the city also awarded DISSSING+WEITLING architecture, a year before the bridge was opened, for raising the bar. An award the City Administration has established to further good ideas. 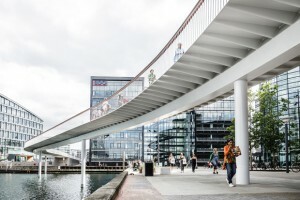 The bridge is a painted, airtight welded steel structure, carried by a central steel spine a 75 cm box girder, from which a series of cantilevered struts, made of folded steel plates, carries the steel plate deck. We aimed for a slim structure, with all parts being structural, hereby reducing the visual impact. We have strived for transparency and simplicity. Structural refinement. The parapet is conceived as a transparent film, no modular hierarchy. In essence underlining the fluidity of movement through space. Celebrating bike riding. Looking out and being seen. 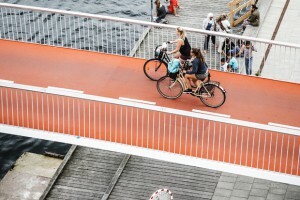 The project went from a ramp to an elevated bicycle route. It winds its way and by doing so it makes the bikers inadvertently slow down. 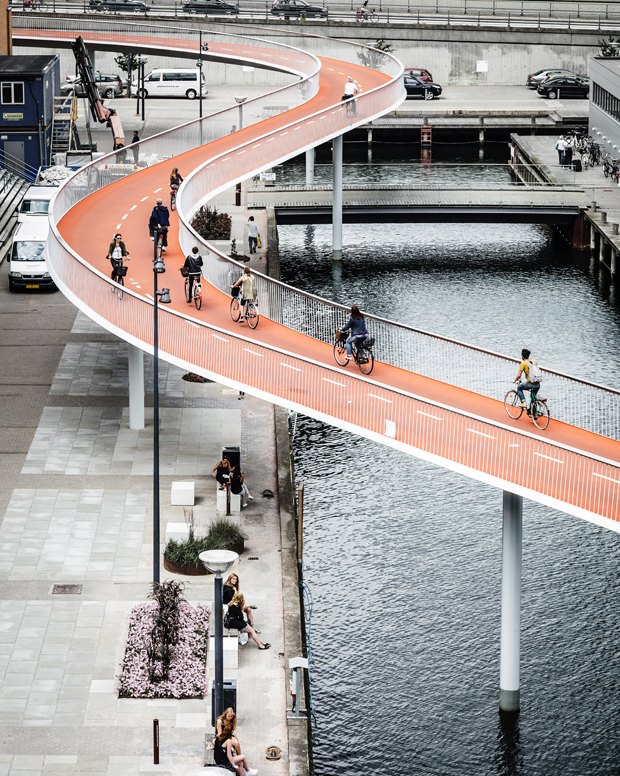 A bike route above land and water. 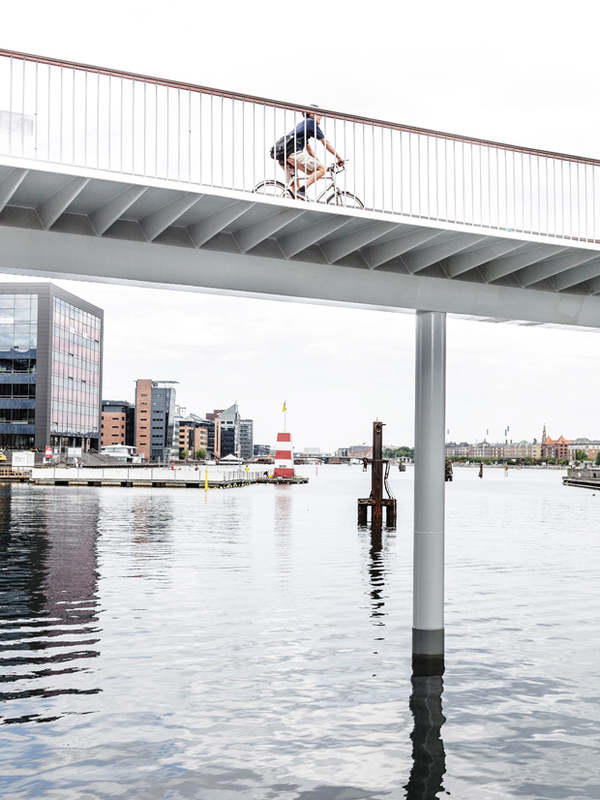 And it barely touches either resting on slim columns with a distance of 17 20 m. It epitomizes the image of Copenhagen as a bicycle City. The pure joy of cycling. It is orange. 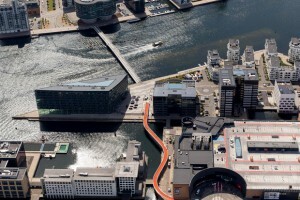 Orange so that it may hold its own elevated place amidst the surroundings. Orange to provide a sense of sensuous luxury. Orange to give it warmth in daytime and at night lit up from the LED strips in the glimmering stainless steel handrails. 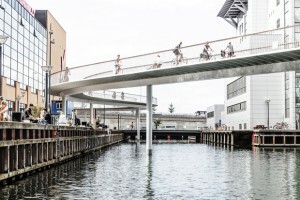 Cykelslangen is not an elevated bicycle route. 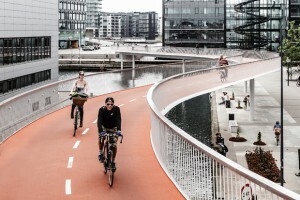 It is not an attempt to establish elevated bicycle routes as such, to separate cyclist from the ground level. 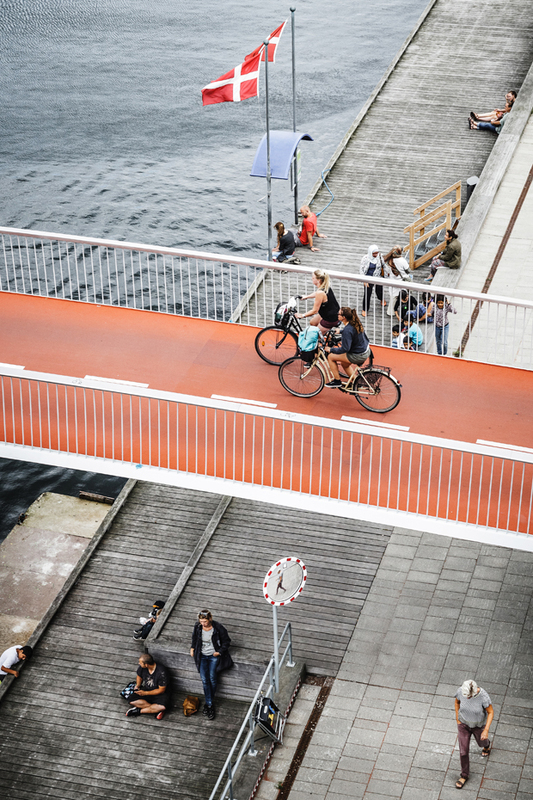 Bicycles should not be isolated from but rather be an integrated part of city life, street life. 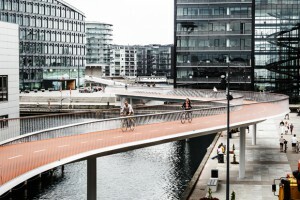 Cykelslangen is a specific answer to a specific problem in Copenhagen. 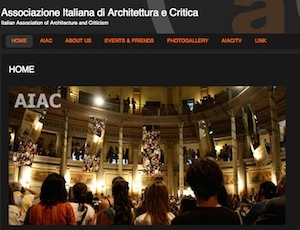 In 2013 DISSING+WEITLING architecture was presented with the ai?? ?Raise the Barai??? 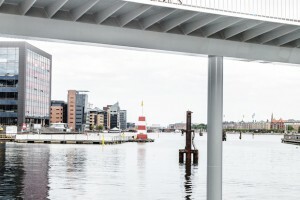 prize from the municipality of Copenhagen, given for the initiative to promote an idea, which reached beyond the assigned brief. 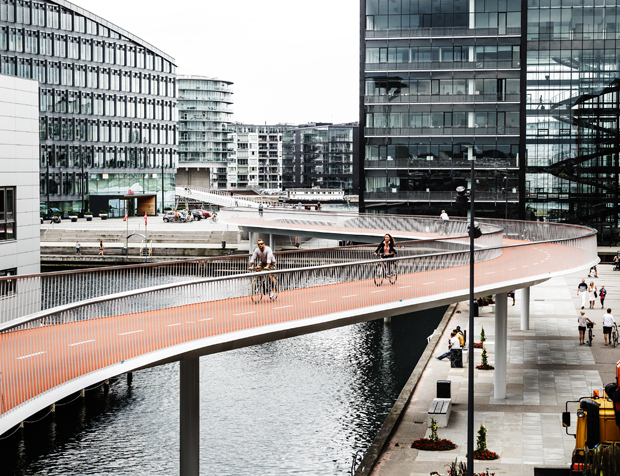 In 2014 Cykelslangen won the WAN Transport Award. 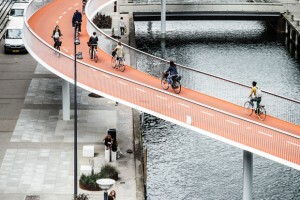 PROJECT NAME: Cycleskagen or “The Bicycle Snakeai??? 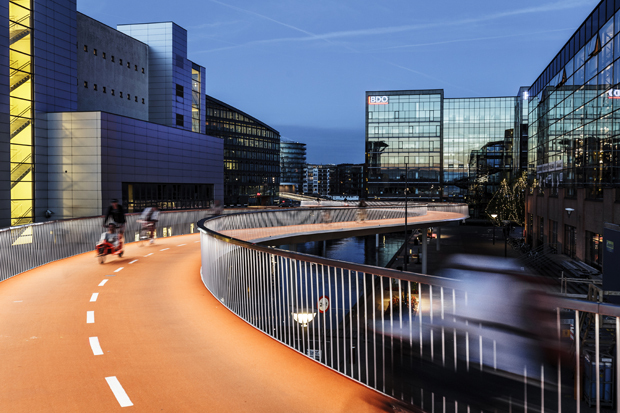 MATERIALS: the anti-slip pavement consists of a granulated stone on an acrylic compound.